Legend has it, since ancient times, a man-eating demon has roamed the woods after sunset. But legend also says a demon slayer will protect the villages with a special sword. So there's nothing to fear...or is there? Kimetsu no Yaiba began in Weekly Shonen Jump #11 by Koyoharu Gotouge. In 2013 Goutouge received the 70th Jump Treasure Newcomer Manga Awards. He has since drawn several one-shots for Weekly Shonen Jump. 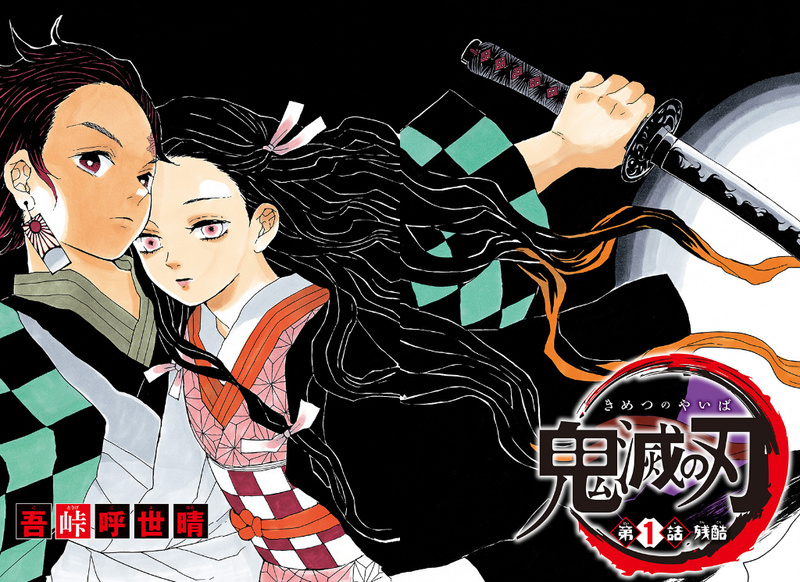 Kimetsu no Yaiba offers a huge contrast to the previous weeks new series, Yuragi-sou no Yuuna-san, in that it's a much darker series. Just in the first 15 pages (out of 55) we have the protagonist's family being murdered by demons and his sister 'mutated' or changed by the encounter. The manga's first chapter follows Tanjiro, a charcoal seller with a keen sense of smell. Tanjiro is the eldest son in a family that has lost its father. Tanjiro visits another town one day to sell charcoal, but ends up staying the night at someone else's house instead of going home because of a rumor about a demon that stalks a nearby mountain at night. When he goes home the next day, tragedy is waiting for him. This series surprised me. I had small expectations for the series but Tanjiro's conflicting emotions are well displayed after discovering his family had been slaughterd, and his despite the drastic changes in his sister he is willing to protect her no matter what.